It doesn’t have four rotors, but this advanced-glider is every bit as impressive as the most complicated of quadrotor offerings. It’s the first glider that can successfully perch on your arm. We can’t help but think back to the owl in the original Clash of the Titans movie. 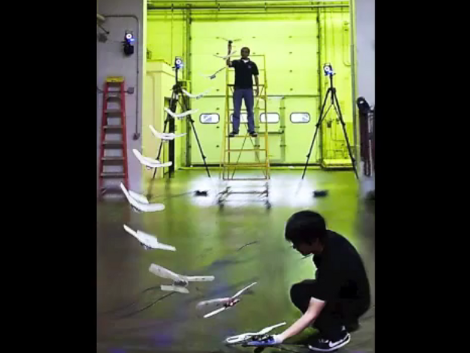 The team at the Aerospace Robotics and Control Lab of the University of Illinois at Urbana-Champaign is happy to show off the test flights they’ve been conducting. We’ve embedded two of them after the break which show the unit landing on this person’s arm, and on the seat of a chair. The image above shows a montage of several frames from the flight, and gives us a pretty good look at the articulated wings. You can seen them both bent in the middle of the flight to zero in on the landing zone. In addition to this there are flaps on the trailing edge of the wings and tail. The flight path is a bit wandering since the glider has no vertical tail to stabilize it. Now if they can make it harvest power from overhead electrical lines they’ve got a spy-bird which can be dropped from a plane (or from a drone). VIA Technologies, ostensibly in an attempt to compete with the Raspberry Pi (if you can believe all those bloggers out there), is releasing a tiny single board computer called the APC Android PC. The VIA website for the APC is down, so just search Google News for all the details. The specs are somewhat similar to the Raspberry Pi – HDMI out, Ethernet, SD card, and a few USB ports – but that’s about where the similarities end. The APC runs a version of Android 2.3 customized for mouse and keyboard input where the RasPi runs Linux. The APC can only display 720p video (compared to the RasPi’s 1080p), and doesn’t have GPIO pins that can be used with Arduino shields. We’re pretty sure VIA is going after the media center PC market here with a low-power board that can easily stream movies or a season of TV shows over a network. At $50, we’re sure the APC will find a home in a few homebrew devices, MAME machines, and carputers. If anything, this only portends a whole bunch of single-board ARM/Linux computers riding on the coat tails of the RasPi. That’s awesome no matter how you look at it. If a $50 Android board doesn’t whet your whistle, VIA also released a Mini-ITX board with 12 hardware serial ports. 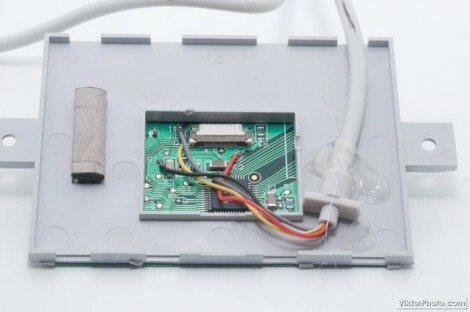 Hardware serial ports are getting rare nowadays despite how useful they are for embedded applications. 12 (with riser cards, natch) serial ports seems overkill, but we’re sure some Hackaday reader has been looking for this board for a while now. I am particularly pleased to be announcing SquidFoo, an Art gallery/studio and hackerspace in Springfield Missouri (hackerspaces.org link). For those unaware, this small town is where I’m located (Brad Pitt came from here too!). I would love to take credit for this hackerspace, but I can’t. [Scott Sauer] and [Phil Broussard] created it and reached out to me when they heard I was in town. I’m going to make up for coming late to the party by helping them get organized, and possibly planning some events. You’ll be seeing more of SquidFoo here because this is probably where I’ll be doing future Hackaday projects for a while! We think in might be absurdly vain, but wouldn’t it be fun to give everyone in your family a chocolate modeled after your mug this holiday season? [Eok.gnah] has already worked out a system to make this possible. It consists of three parts: scanning your head and building a 3D model from it, using that model to print a mold, and molding the chocolate itself. He used 123D to scan his face. No mention of hardware but this face scanning rig would be perfect for it. He then cleaned up the input and used it to make a mold model by subtracting his face from a cube in OpenSCAD. That needs to be sliced into layers for the 3D printer, and he used the Slic3r program which has been gaining popularity. 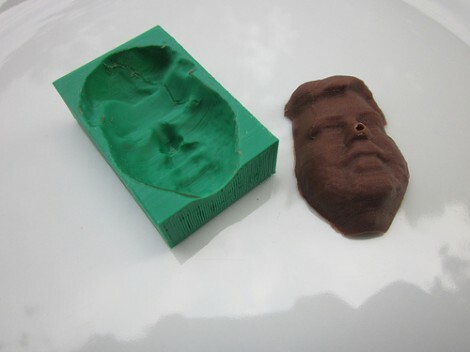 Finally the mold was printed and the face was cast with molten chocolate. We’d suggest using a random orbital sander (without sand paper) to vibrate the bottom of the mold. This would have helped to evacuate the bubble that messed up his nose. You know, it doesn’t have to be your face. It could be another body part, even an internal one… like your brain! Virtual card games proliferate the interwebs, but this card-playing telepresence device is unique. [Patrick] calls the project Vanna, and we’d bet that’s an homage to the tile-flipping TV star [Vanna White]. Much like she flips the blank tiles to reveal letters, this device can flip the hand of cards either face up or face down. Each of the six card trays is connected to a stepper motor. 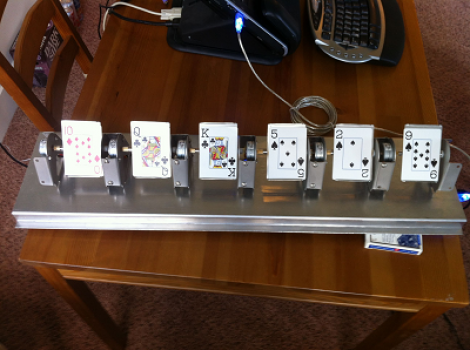 The local player deals the hands, placing each card in a tray so that it faces the webcam for the remote player. That remote player has an on-screen interface that can discard by tilting the tray forward and dropping the card on its face, or play a card by tilting toward to the local player so they can see its face value. All becomes clear in the clip after the break. The hardware is USB controlled from a Windows machine thanks to the PIC 18F4585 which controls it. But it should be quite simple to get it talking to the OS of your choice. What started off as a fun project using light bulbs picked up some sponsorship and is going on tour. 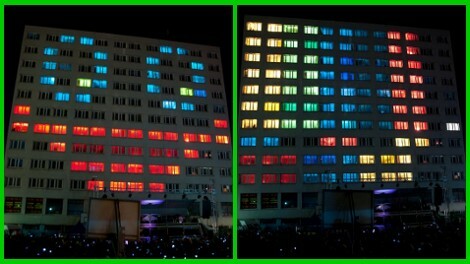 This project now uses LED modules controlled on the 2.4 GHz band to turn buildings into full color displays. It’s the product of students at Wrocław University of Technology in Poland. The group is something of an extra-curricular club that has been doing this sort of thing for years. But now they’ve picked up some key sponsorships which not only allowed for upgraded hardware, but sent the group on a tour of Universities around Europe. Who would’ve thought you could go on tour with something like this? Much like the MIT project we looked at in April, this lights up the dark rooms of a grid-like building. It does go well beyond playing Tetris though. The installation sets animations to music, with a custom animation editor so that you can submit your own wares for the next show. Don’t miss the lengthy performance after the break.